Question 1: What’s in the Newsletter? An article about how to improve some aspect of your performing. Recent articles have included topics such as: Developing a routine to music, Using comedy in your performances, how to recover from dropping props, cool and simple ways to use juggling props etc. News about my latest Juggling activities! 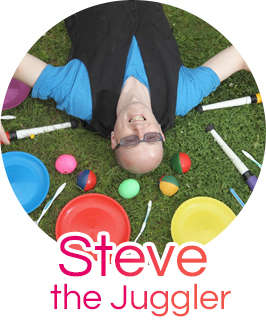 So if you have an interest on grabbing a bargain, improving your skills, finding out when new content (including video clips) are added to the site or simply would like to read my latest juggling news and find out what is going on with Steve the Juggler, then this newsletter is for you! There are currently over 550 subscribers, so why not join them! Question 2: How often will I receive the newsletter? I don’t intend to send out any more than 3-4 newsletters per year, because I only want to write when I have something to say and a decent amount of time to write a quality juggling article! If for any reason you would like to cancel your subscription, you can click the unsubscribe link at the bottom of the e-mail newsletter or drop me an e-mail and I will manually remove your details. Question 3: Are my details safe?